Anyone can purchase a regular old baby blanket. 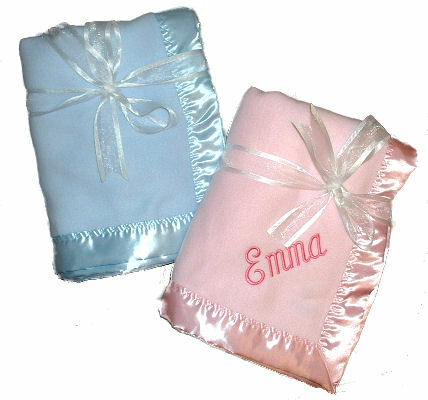 If you really want to make a special gift, consider personalized blankets for baby - it's a one of a kind customized baby gift that new parents love to receive. Nordic fleece is super soft on the skin, with a decorative stitching on the binding. You won't find a high quality blanket like this just anywhere. Monogrammed name or initials are included in the price. 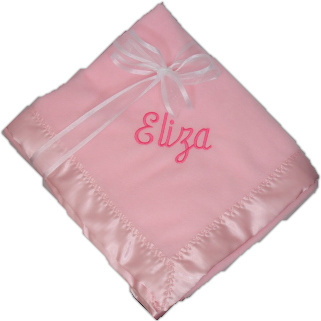 Date of birth and birth weight are optional embroidery that can personalize your baby blanket. Every baby needs a blanket - why not make one they'll cherish? Crib blanket size 36" x 52"